At Superior, we collaborate with owners, architects, structural engineers and contractors to evaluate each project’s unique requirement and engineer mixes to meet their needs. Selecting the optimum mix for a job entails determining not only the ingredients that will produce the desired permeability, strength, appearance and other properties of the concrete after it has hardened and cured, but also the ingredients necessary to achieve a workable consistency considering the weather and other conditions at the job site. The most used material in construction is water and Superior has taken great strides in ensuring the proper care of this important resource. Superior’s wash-out procedures consist of using 100% recycled water to wash-out all mixers and plant equipment. The D.C. plant also reuses recycled water back into 80% of its concrete. With an average of about 220,000 cubic yards of concrete annually, this is a significant reduction is water used. ARIDUS Rapid Drying Concrete reduces the drying time and risks associated with excess moisture vapor in concrete slabs, enabling faster, more effective floor topping installations. 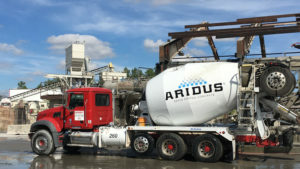 ARIDUS Rapid Drying Concrete was developed and patented by U.S. Concrete’s National Research Laboratory, USC Technologies, Inc. to address recent changes in environmental government regulations that limit or restrict VOCs in flooring adhesives. While these new formulations may reduce the environmental impact of new flooring installations, the new adhesives are less durable and more susceptible to moisture-related issues. In response, contractors have been forced to combat the problems by adding sealers or lengthening the drying time of the concrete, in hopes of reducing the risk of liabilities associated with the failures of floor coverings. In addition, these remedies increase construction time and costs associated with the projects. And none of these remedies address how to reduce the moisture. Superior Concrete Materials, is recognized for delivering the highest quality and service to high-profile projects in the Washington, D.C. metro area, including: Dulles International Airport Fourth Runway and Taxiways, Arena Stage, Marriot Marquis, CityCenterDC and City Market at O Street.